On June 19, 2013 I turned on the news to see the face and name of a man I’d previously never heard of. The name was Vince Flynn, author of the Mitch Rapp franchise, and the breaking news ticker scrolling across the bottom of the screen was announcing that he’d lost his battle with cancer at the age of forty-seven. Little did I know then, that Vince would become someone I’d look up to and respect more than words could ever describe. He’s my idol, my hero… And I’m sorry I never got to meet him and tell him that. Nor did I ever think, at that time, for a second, that he would become my favorite author. Or that I’d begin collecting his novels and that I’d cherish them more than just about any other earthly possession(s) I own. Life is funny like that I suppose. Two years later its hard to imagine what my life was like before I was a fan of Vince Flynn. Discovering him changed everything for me, I’d certainly never want to go back! My favorite television show is 24, and on the news that morning the women at the anchor desk mentioned that Vince had worked as a consultant for the show during its fifth season, which just so happens to be my favorite of them all. For what it’s worth, critics seemed to agree, as season five is widely regarded as the best in the shows run. Anyhow, I almost just went about my day without ever giving a second thought to who this author was, or what his books were about. Man am I glad I didn’t! I guess now is a good time to mention that up to this point I’d never read a book in my adult life, seriously. My wife loves to read, as does our oldest daughter. My kids (we have five now, four at the time of Vince’s death) had been trying to get me into reading for a while but I just never understood the lure of a book. I preferred television or movies – something where I can watch the action unfold before me. With nothing to do for a few moments, I turned the news off and ran a Google search on Vince Flynn. A few things jumped out at me right away. First, I read a quick biography and learned that Vince struggled with dyslexia when he was younger. This has been something I’ve struggled with as well, which was definitely one of the reasons I hated to read most of my life. Rather than give in and avoid books, though (like I did), Vince used reading as a way to overcome dyslexia. I also learned that the books Vince wrote were about a CIA operative, which is something else that immediately interested me. A few days later I decided to buy American Assassin, the first (if you’re going in chronological order) novel in Flynn’s Mitch Rapp series. Enter Mitch Rapp into my life – and nothing has been the same ever since! I was only a few chapters into American Assassin when I made the decision to get back onto Amazon and order hardcover copies of everything else Flynn had written. I was hooked, deep. After finishing Assassin I had a couple of days to kill (no pun intended) before the next novel – Kill Shot – would be arriving in the mail. I decided to fill my free time by doing more research about Vince. Two things. First of all, Bestler is a heavyweight in her own right. She’s currently the Senior Vice President and Editor-in-Chief of Emily Bestler Books – an imprint of Atria Books at publishing powerhouse Simon & Schuster. I like to think of Vince as Mitch Rapp, and Bestler as his Irene Kennedy. Mitch might be the headliner, but Kennedy runs and keeps things in order behind the scenes — that’s Bestler. Secondly, the answer to her question is “yes”. I do remember the first time I fell in love with a book, it was American Assassin followed by every other book Vince wrote. To Emily, and everyone else that was a part of Vince’s team, thank you. Clearly, he thought the world of everyone he worked with, and anyone who reads the “acknowledgements” section in any of his books can tell that immediately. As the story goes, I actually broke down and bought the e-copy of Kill Shot because I just couldn’t wait two more days for the hardcover to arrive from the Amazon seller. I’d finished the book by the time it arrived, it took me just under a day to read it. I steamrolled through everything Flynn wrote, all fourteen novels, one of which (Term Limits) does not feature Rapp. What followed, after completing his final book, was something I did not expect… a feeling of emptiness. Remember, I wasn’t a book lover. Actually, in truth, I’m still not. I’m just a huge fan of Vince Flynn and Mitch Rapp, and nothing else I’ve ever read has come close to the excitement I feel over a new Rapp novel. I mean, sure, I do read. I actually buy everything from Emily Bestler Books just to support them (I am Pilgrim was awesome!) but once I’d finished The Last Man I knew there were no more action-packed rides for me to take with Rapp. It was a strange feeling, especially considering the fact that I essentially despised books before all of this. I was an action movie guy and just happened to stumble upon the Picasso of written action scenes, by chance! Nobody can vividly illustrate, with such vibrant dialogue, written action sequences the way Vince could. He was, is, and always will be the master of his genre. Next, the realization set in for me that I really missed out as a fan by having discovered Vince Flynn after his passing. Don’t get me wrong, his family and friends are suffering far greater than me and every other fan, I know that. it’s just that I realized not only would I never have a new Rapp book to read, but I’d also never get to experience what it’s like to anticipate a new release and the excitement leading up to it. That, of course, also meant that I’d never get to go to a book signing, meet Vince or get his signature on one of my books. Hoping to fill that void, I ordered signed copies of my favorite Rapp novels (American Assassin, Transfer of Power, Memorial Day, and Consent to Kill) from Amazon. I suppose this is a good time to mention I have a loving, supportive and, thankfully, understanding wife. While the signed copies are awesome, and I was certainly thrilled to get them, that excitement fizzled to some degree when I realized that it was possible I was duped into buying several books that I already own, without total proof that they were in fact signed by my idol. I wouldn’t know a forgery from an authentic, unfortunately. Again, little did I know that pretty soon my world was about to be rocked! At 12:11 in the morning on June 23, 2014 I heard my phone chirp, indicating I had a new email. I was in bed, half asleep, and almost put off checking it until morning. VINCE FLYNN’S MITCH RAPP SERIES WILL CONTINUE; THE SURVIVOR TENTATIVELY SCHEDULED FOR 2015. It took about three seconds for me to jump up, scream with excitement and wake up everyone in my home – including our new baby girl who, naturally, is named after Rapp’s wife, and was three months old at that time. Yeah, that happened. Actually, to my delight, my wife was happy for me. Again, she’s very understanding and supportive. Now, I had of course already previously learned that Vince had passed away while working on a new book, called The Survivor. I also knew that it was meant to be a follow-up to The Last Man. The internet was littered with rumors about what would happen with the Rapp franchise going forward. I literally checked online, doing Google searches every day, for months searching for any hint to what might happen, if anything, moving forward. This announcement had come out of the blue… I didn’t see it coming… and, well, I didn’t sleep a wink that night. I was way too excited, and had to celebrate – by reading a Rapp book – of course. In my excitement I wanted to talk to someone, anyone, about this awesome news. The problem was that it was now approaching one in the morning and nobody was awake! So I got onto Facebook and went to Emily Bestler’s page. I wrote to her about how much Vince meant to me and what a big fan I am. Next up, I found the website for Kyle Mills. Mills is the author hired to continue the Rapp franchise, and finish The Survivor. He is a fabulous author in his own right, I encourage Rapp fans to check him out. Anyways, I fired off an email to Kyle – never expecting to hear back from him – letting him know that Rapp fans would be behind him, and how excited I was about a new book. I briefly explained to him how I became a fan and how much Vince and Rapp mean to me personally. I even shared with him my disappointment at the thought that I’d never get to go to a book signing, or meet Vince. Yet, thankfully, now I was going to finally experience the excitement of a new release, and for that I couldn’t have been happier. The next day I experienced another jolt of excitement when I opened my email and saw Kyle had responded to me. He was kind and gracious, and even recommended a couple of books that he’d already written for me to check out that were similar to Flynn’s style. I did, of course, and Kyle is awesome. Of all his books, I enjoyed Free Fall, Fade and The Ares Decision the most. They are exceptional! After that, I found out that my email to Mills was going to be used as the “fan email of the month” on Vince Flynn’s website. The timing was perfect as I received this honor during the month of July – which is pretty cool since my Birthday is July 30th. Several days later there was a knock on my door, I had a package. I signed for it, returned inside and began to tear it open. I first pulled out a hand written note from Vince’s publicist, David Brown. David’s was another name I knew as a part of Vince’s teat from reading the acknowledgements his books. Vince called him the “best publicist in the business” and thanked him for his humor, among other things. 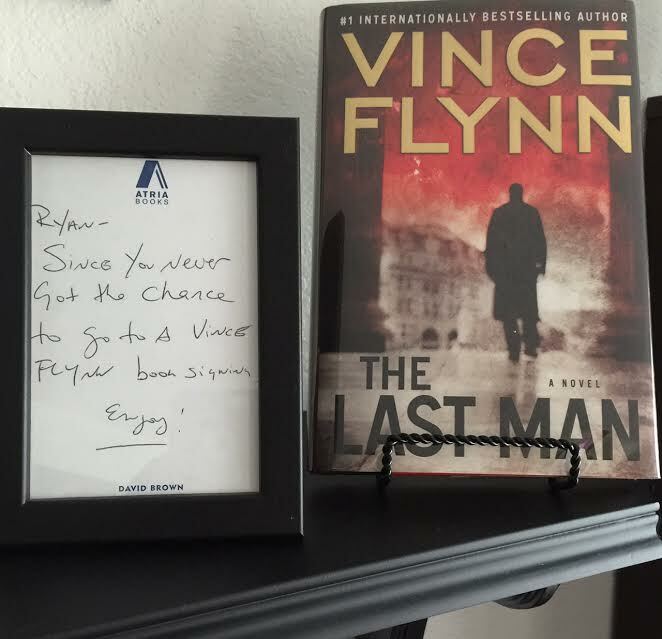 “The Last Man” by Vince Flynn, signed by my hero, Flynn himself! I’m not trying to be overly dramatic here, really, but my heart about jumped out of my chest as I pulled out a hardcover copy of The Last Man. I opened it, flipped the page, and there it was… Vince’s signature. Yeah, I have other signed books like I already mentioned, but this time was different. This time I know for sure, thanks to David Brown, that Vince really signed it. What an incredible gift. Thank you again, David! After the birth of my children, and my wedding day, this is bar far the coolest thing I’ve ever experienced. Nothing could top that moment, or the memory its given me, ever. Just ask my wife, who then joked to everyone that no matter what she got me for my birthday that year it would never stack up to what I’d just received in the mail. Thankfully, she was happy for me, ans she too was stunned. Since that day I’ve been riding a wave of excitement, anxiously awaiting The Survivor to come out – which will be available on October 6, 2015. I’ve already got it per-orderd on Amazon, I hope you’ll do the same! I can’t wait to take another ride with my buddy, Rapp. I’m also excited to see where Kyle Mills can take this franchise, and I believe he will be excellent at the helm. I can’t by any means say that I know him personally, but I can tell you that from several emails back-and-forth with him, that he’s definitely a fan of Mitch Rapp himself. If it can no longer be Vince writing him, then the right man was chosen, in my opinion, to breathe life back into Rapp. Vince will never be replaced, ever. His work will remain and I’ll always consider him the greatest author of my generation. Rapp will live on, and I imagine that’s just what Vince would have wanted. I realized that more than just loving his writing, I admire Vince as a man. He sure seemed like a great guy, and I’d have loved to meet him. My thoughts and prayers go out to his family, especially his wife Lysa, and their children. To everyone at Emily Bestler Books that’s taken time to email me, or even to just respond to me on Twitter, I appreciate every interaction more that I could ever express. Thank you. Vince touched a ton of lives, and I think it’ll be a LONG time before he’s ever forgotten. I couldn’t help but smile and nod in agreement with almost half of your “Mitch Rapp” experiences as they mirror mine. I’ve never been much of a reader until I joined the military and went overseas. Once there, when I wasn’t working and had down time, besides working out there wasn’t much to do. Backing up a bit, on my way to Afghanistan with the US Marines at the air force base we traveled through, I noticed a bin of books and a sign that sad “Thank you for your service, please help yourself” I grabbed one book, super randomly that just happened to look interesting. Once I got to Afghanistan, it took about two weeks for boredom to compel me to pick up this book and give it a read…. This book just happened to be Memorial Day by ours truly Vince Flynn. Once I read this book, I was hooked. But unfortunately I didn’t have access to anymore books at the remote location we were at. Soon thereafter, we went for supplies at a larger base which, had wi-fi in the recreation center. It took me a few hours, due to poor quality and so many people trying to connect on one router, but I did it. Downloaded my wive’s Nook app and purchased all of his books. Since then, I have read them all multiple times and I CANNOT wait to read The Survivor. I am beyond excited that Mitch Rapp will continue. I would also like to take a moment and say Rest in Peace to the late Vince Flynn. Like Ryan, I wish I got a chance to meet him and tell him what a privilege it has been to read his books over and over again and also say THANK YOU for getting me through some of the toughest moments in my life while serving overseas by forgetting where I was and diving into one of his many awesome books. Thanks so much for sharing, and thank you for your service to our country! Your story is inspiring, and I enjoyed reading your comment. I’ll wrote more later, thank you! Vince Flynn ruined my life. Every other book i’ve read after the mitch rapp series has been a disappointment. I often find myself wondering why didn’t he begin his writing career earlier maybe he would have written more books. I’m leaving this comment so a fan can recommend a book series as good as vince flynn’s mitch rapp. I was devastated when there were no more Vince Flynn books. Brad Thor rescued me! Check out his Scot Harvath series, and give it some time to sink in. He’s my favorite living author! Also, Ted Bell. He and Kyle Mills (with Brad Thor) make up my favorite authors alive and writing today. Mills is continuing the Rapp franchise, and he’s simply brilliant! Are you ok Twitter? Find me @MitchRappFans and ask me this question so I know it’s you. I will help you out!